The Gritstone Series is ever evolving and changing, for 2014 we added our most northly race, the “Grin & Bear it”. This is organised by Woodhead mountain rescue. We are keen to add another longer race to the series, at 15 miles and taking in a different part of the Dark Peak; so the Grin & Bear it ticked all the boxes. Starting at Langsett barn the race climbs up to the very remote, bleak, boggy but spectacular Outer Edges, which was recently described by one of our customers on a recee as a “lunar landscape”. Although the peak bogs can be intimating especially after rain you normally don’t sink too far. But be warned there is an especially deep bog but we have been assured that a member of the mountain rescue team will be there to take you picture before helping you out! All the checkpoints will be manned by mountain rescue so there will be plenty of marshals out of the course. 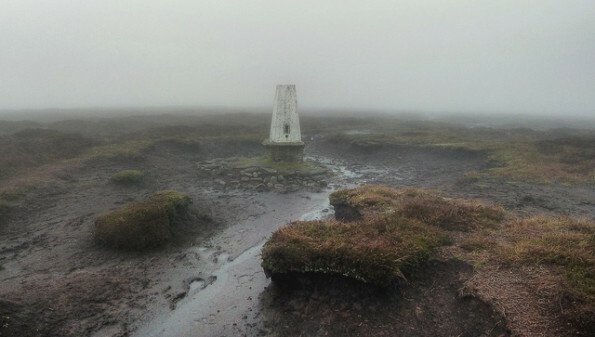 You will have to navigate your own way between the check points so map and compass are essential especially if the mist is down (picture). I spoke to Simon the race organiser this week to confirm a few details. The race start is 10:30am NOT 10am as on some documents. Plus there is entry on the day for runners. It will cost you more to enter on the day but as the money is going to Mountain Rescue I am sure no one will mind. There will be much needed hot food available at the end. Plus the Lord Major of Sheffield is starting the race. Having not done the race before I am very jealous of everyone taking part. I do have a love/hate relationship with Outeredges it is amazing we have such wilderness so close to cities and main roads. I love jumping across peat bogs but I do get flash backs to various High Peak Marathon adventure when up there! I will be here at Accelerate as it is a Saturday, however Stu will be out and about, with his camera, so don’t forget to smile as he snaps away and cheers you all on. Hopefully he will bring some cake back to the shop, or there could be an ‘issue’. If anyone has any questions on the race or kit for it do give us a call 0114 2422569. It is full FRA kit: full waterproof cover- top with hood and bottoms, hat, gloves, whistle, map, compass and emergency food. It is going to be a tough but fantastic race, ENJOY!